What is it you find yourself asking? French native crossing of Petit Syrah and Peloursin, propagated by Dr Durif (I would also name a vine after myself!). In it’s native land of France, it was not considered to be a grape of high quality and you’ll be hard pressed to find it these days. 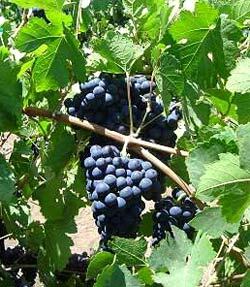 It is found in USA, notably in California and is labelled under Petite Syrah. In Australia, Durif found a welcome home in the hot land of Rutherglen, in North-Eastern Victoria. Here it makes inky, ballsy, tannic wines of lionesque magnificence. Recently, Riverina and Riverland have jumped onto the band wagon but have yet to produce anything that I have tried that would give Rutherglen Durif a run for the money. My love for Durif started fairly early, with plenty of stumbling blocks, with a fairly common question of “what is durif?” from everyone else’s lips. Vintage Cellars was the place, during work hours and an article about a maligned grape that is unloved in it’s native land but that has found a very welcome spot in the land of fortifieds – Rutherglen, Victoria. With a bit of hunting down I tried my first sip, and the love was confirmed – Morris Durif. A two week stint at the Sydney Easter Show helping with the Hunter Valley Wines stand, momentous meetings with like minded Durif-iles and The plan was set, and with just over a year after first sight the trip to the heartland was set! Highlights: Morris of Rutherglen, All Saint’s Estate, Anderson Winery, Campbell Wines, Pfeiffer Wines, Mount Prior, Stanton and Killeen, Valhala and Vintara (Tempranillo and beer). Confessions of a Durif Tragic by Andrew Sutherland Smith, Winemaker and self confessed Durif Tragic @ Warrabilla Wines, Rutherglen. Sounds interesting? Think about visiting…I’d take at least a week as 3 days is simply not enough to try it all. Oh, and yeah, bring a driver!